After launching LeEco Le pro 3 in September the Chinese smartphone maker decided to launch the LeEco Le Pro 3 Elite smartphone. 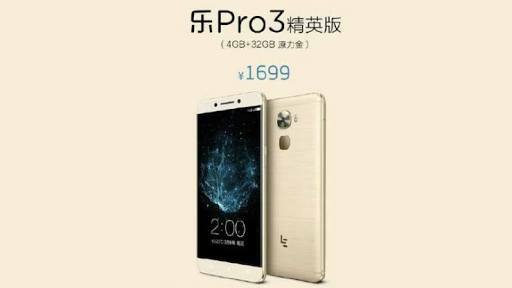 Even though the Elite moniker is used the smartphone is essentially the cheaper variant if LeEco Le pro 3 with no NFC and slightly downgrade processor and priced at CNY 1,699 (approximately 16,500) . The LeEco Le pro 3 Elite is already available in company’s china site for purchase. Design wise the LeEco Le Pro 3 Elite is similar to LeEco Le Pro 3 smartphone. The Specifications of new variant is powered by Snapdragon 820 Soc instead of Snapdragon 821 Soc and there is no NFC support. Apart these two changes all other Specifications remains same. The LeEco Le Pro 3 Elite sports a 5.5 inch full HD (1920×1080 pixel) display with 2.5D curved glass and in cell tech with 403ppi pixel density. The Smartphone powered by Snapdragon 820 processor with Adreno 530 GPU coupled with 4GB RAM and 32GB inbuilt storage. The LeEco Le Pro 3 Elite features a 16Mp rear camera with f/2.0 aperture PDAF HDR BSI CMos sensor 4K Video recording at 30fps and a slow motion recording of 720p at 120fps. On the front an 8Mp camera with f/2.2 aperture and 76.5° wide angle lens. The LeEco Le pro 3 Elite runs EUI 5.8 based on Android 6.0 Marshmallow. The connectivity options include it supports dual nano sim cards with 4G LTE support, wifi 802.11 a/b/g/n/ac, GPS, A-GLONNAS and Bluetooth V4.2 . The LeEco Le Pro 3 Elite packed with 4070mAh battery and the finger print sensor is on the back side if the device.